Dharma Kings and Rinpoches from around the world, Members of the U.S. Congress and Diplomats attended the Library of Congress H.H. Dorje Chang Buddha III book presentation ceremony. WASHINGTON, April 4, 2008 /PRNewswire-USNewswire/ — H.H Dorje Chang Buddha III: A Treasury of True Buddha-Dharma, a book that confers the most evolved and enlightened status on H.H. Master Wan Ko Yee, was presented to the Library of Congress yesterday at an event attended by Members of Congress, the Diplomatic Corps and sixteen Dharma Kings and Rinpoches from around the world. The book acknowledges and authenticates for the first time that H.H. Master Wan Ko Yee, an international master of Buddhism and permanent resident of the United States, is the actual reincarnation of the primordial Buddha. It is the second time in more than 2,500 years that Dorje Chang Buddha has manifested himself in human form and the third time that Dorje Chang Buddha has manifested in the universe. The book records and verifies H.H. Master Yee’s spiritual enlightenment and his many accomplishments as a world-class Yun sculptor, artist, poet, calligrapher, philosopher, painter, and medical expert in healing illnesses. More than twenty holy leaders of Buddhism, employing the rules of Buddhism, have formally determined and verified through personal attestations and written proclamations that H.H. Master Yee is the holiest and most honored leader of Buddhism. “H.H. Dorje Chang Buddha III Holiest Tathagata is the most compassionate, the kindest, the holiest and the purest being of all. The wisdom of His Holiness is complete, and His learning is exceedingly profound. 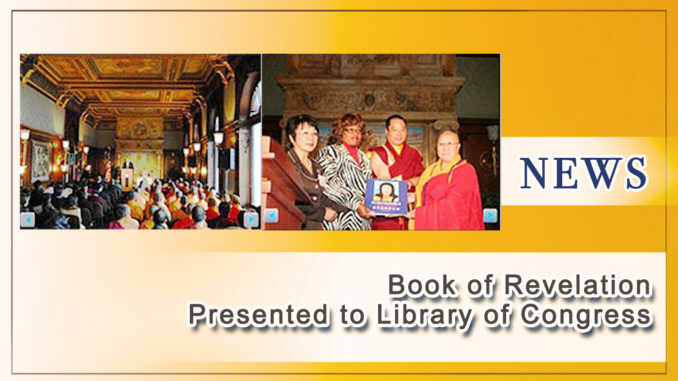 He is the Buddhist equivalent of the Pope,” said Shih Long Hui, Chairperson of the International Buddhism Sangha Association, who presented the book to Dr. Judy S. Lu Chief of the Asian Division of the Library of Congress of the United States. H.H. Master Wan Ko Yee was in seclusion praying for his Tibetan Monks and for an end to the conflict and human suffering occurring in Tibet at the hands of the Chinese Government. Buddhism is a body of religious traditions, philosophies, and teachings all in pursuit of enlightenment and truth. The religion was founded approximately in the 5th Century BCE by Siddhartha Gautama, an Indian prince who renounced his throne to dedicate his life to teaching his insights (dharma) on the nature of the universe and the alleviation of suffering in the world. Having attained enlightenment (bodhi), he was known as Buddha, or “Enlightened One.” The many traditions that make up the worldwide Buddhist Sangha, or society, maintain his legacy by preserving and teaching his philosophy. Buddhism is the fourth largest religion after Christianity, Islam and Hinduism.